We just watched a reasonably entertaining round of A-League action, but guess what? All the headlines were about an SCG pitch that clearly endangered player safety. The Professional Footballers Australia association released a statement about it. So too did Football Federation Australia. And everyone from Victory coach Kevin Muscat to Sydney FC chief executive Danny Townsend chimed in with their thoughts on Saturday’s diabolical surface. There are no easy answers here. Football in Australia is undeniably part of a multi-code landscape and that means sharing surfaces with rival codes. Add to that the uncertainty around where Sydney FC can even play their home fixtures for the time being and football ends up with the SCG as a supposedly suitable venue. But a bit of foresight wouldn’t go astray either. By quirk of fate I happened to be at the SCG last Thursday night for the Roosters’ clash with the Broncos in the NRL, and it was obvious then that the pitch was going to be in no state to host a free-flowing A-League match two nights’ later. So how does the venue get signed off on game day? Do the wants and needs of spectators and broadcasters triumph over player safety? It’s hard to imagine how anyone thought the SCG would make a decent football stadium in the first place, although it’s worth pointing out a couple of caveats from Sydney FC’s point of view. The first is that they’ve been understandably reluctant to give up their foothold in Sydney’s CBD. Jubilee Stadium in Kogarah might be a superior venue for fans and broadcasters alike, but it’s still in the city’s southern suburbs. There’s also the fact that, when the fixture list came out, there was probably a hope that Saturday night’s encounter would attract well over 20,000 fans. But the way this A-League season has gone that was never going to happen. So it is that we’re once again left with the frustrating spectacle of an A-League game being played at a venue that is clearly not fit for purpose. And the game has got to get better at making sure that no longer happens in future, including finding a way to convince decision-makers in government that it’s not merely a multi-purpose kickabout that can be played on any old surface. 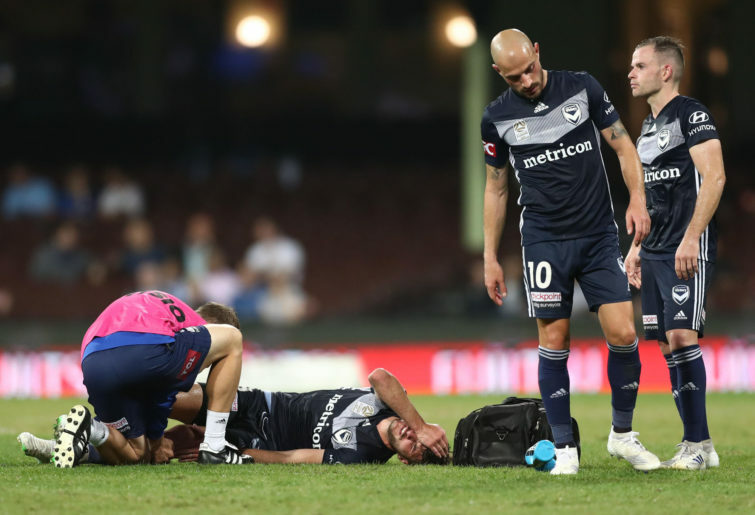 The action itself was fairly entertaining across the weekend, starting with Melbourne City’s demolition of Brisbane Roar and ending with Perth Glory’s comfortable win over the Central Coast Mariners. Was Ritchie de Laet’s or Riley McGree’s the better goal for Melbourne City? Was Brandon O’Neill’s or Milos Ninkovic’s goal more dramatic for Sydney FC? Will we ever find out who owns Adelaide United? Sorry, what I meant to ask was what exactly did Apostolos Stamatelopoulos put in his water bottle at the half-time interval? In all seriousness, for the entire season the action on the pitch has been overshadowed by administrative problems off it. It needs to change, although I suspect there are going to be some pretty seismic shifts over the off-season anyway. At the very least it sounds like the SCG will no longer be considered a viable venue for the remainder of the season, with Sydney FC likely to switch their upcoming clash with Perth Glory to Kogarah and any potential grand final likely to be played at ANZ Stadium in Homebush. That’s a sensible decision and one the FFA should be commended for, although it’s a shame it has all come to this. Saturday night’s clash between the Sky Blues and the visitors from Melbourne was a gripping game of football. It’s just a pity all the headlines were once again dominated by a dodgy pitch.